How many times have you clicked into a web page only to find out it was not the one you thought? Or maybe you are doing research and are trying to find one document in the midst of several very similar documents and end up having to click into each one? We have all gone through this and moving from page to page or screen to screen is slow and tedious. This is another area where the docMgt “Fast Lane” can help. ‘Fast Lane’ is built around the philosophy of making users’ lives as easy as possible. Anywhere we can remove a click or two we will do it. As the age-old adage goes – time is money! Any time we make work easier or quicker we consider that a Fast Lane approach. Typically we do that behind the scenes but there are times when the Fast Lane changes are more obvious. Record Preview is one of those times. docMgt shows most of its lists in some form of thumbnail view. These thumbnails are great for getting a general sense of the document that is contained in the Record. 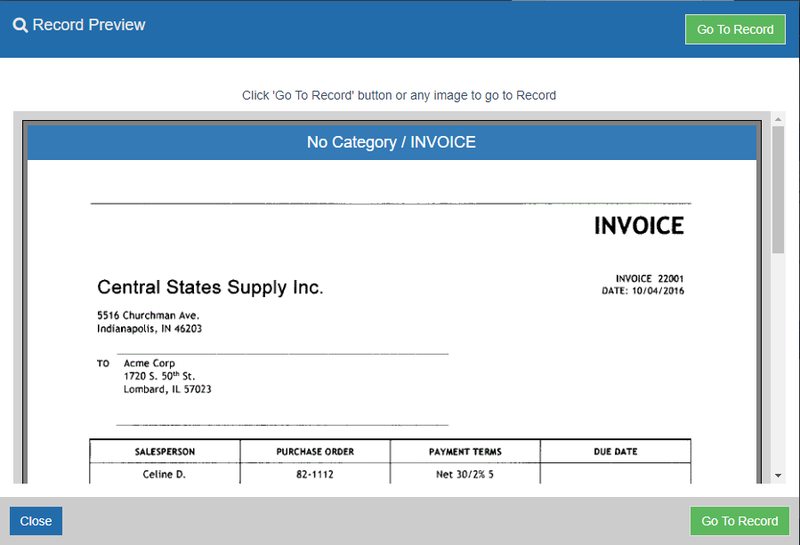 However, if you are looking for one invoice out of 20 that all look the same from a thumbnail perspective, the thumbnail alone is not enough. Hover your mouse over the thumbnail and you will see one or more action buttons at the bottom of the thumbnail. The Record Preview is the searching glass icon on the right. Click the Preview icon and a preview window will pop up showing the basic index information for the Record. Also shown is the first page of each of each of the documents that you can scroll through. If you determine this is not the Record you want just click the Close button. If this is the Record you want then click either of the Go To Record buttons. You can also click on a document in the preview window to go to the Record and open that particular document in one click. Another tip is to hold the control key (CTRL) down while clicking the Go To Record button or a document. By doing this you will open a new tab in your browser. This will enable you to have multiple Records open at once. This new feature will be a big time saver for a lot of users. That is why it is considered a Fast Lane feature. As always, if you have any Fast Lane ideas please let us know! This feature is available starting with version 3.23 which is due out in mid December, 2018.